Summary: Integrator editorial adviser and columnist Taylor Walsh shares a hopeful U.S. Department of Education program that has everything to do with "integrative health." To be awarded as a "Green School" by the U.S. Department of Education means implementing a whole system view of health. As Walsh explains, this can mean engaging the nation's childhood obesity epidemic. While not regular Integrator fare, the story is not only interesting but raises questions about the optimal role of integrative practitioners and their related organizations in urging public health approaches, including in elementary school education, that influence the pervasive and powerful social determinants of health. A humbling reality for any clinician is encountering the fact that therapeutic interventions account for as little as 15%-25% of the health of a population. 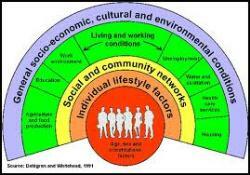 Many extra-office determinants of health are much more significant factors. Integrator columnist and adviser Taylor Walsh reminds us of this with this exceptional column on a federal government program that recently acknowledged 78 Green Ribbon Schools. Walsh notes that the obesity epidemic in our children lurks behind this program. He shares that the three "pillars" to measure greenness are: environmental impact and energy efficiency; healthy school environments; and environmental and sustainability education. Walsh celebrates these initiatives as fascinating grassroots initiatives, often engaged in some partnership with state or local governments. I am reminded of the philosophical underpinning of the National Prevention, Health Promotion and Public Health strategy imbedded in the Affordable Care Act. Promoted originally by the Samueli Institute as the Wellness Initiative for the Nation, that plan fundamentally acknowledges that our Nation's health is as much - or more - a function of energy policy, transportation policy and education policy as it is our healthcare policy. Walsh rightly gives kudos to the US Department of Education for stimulating this program and honoring these innovations. It is a rite of spring in the Nation's Capital: a proliferation of health-related conferences, meetings and extravaganzas. In the first week of June I attended three variations, always looking for evidence of integrative practice somewhere on the agendas. The associations are most often indirect at best, as it was at a presentation by the Bipartisan Policy Center, whose Nutrition and Physical Activity Initiative released its recommendations for addressing the nation's obesity epidemic; as it was amid the cheering at the boisterous third annual Health Datapalooza, which attracted multitudes of technology developers and entrepreneurs seeking to make something of the massive amounts of health data being released by federal agencies and health institutions. Then there was the Green Ribbon Award ceremony held by the US Department of Education. None of these initiatives was launched as the result of any dictum, funding or program from the Dept. of Education. They are all invariably true grass roots endeavors, responding in recent years to what I take to be an awareness in the collective consciousness that the health of our population and resolution of the obesity epidemic can't wait for the national health policy apparatus to come up with a solution. Although the grim reality of unchecked obesity among our youngsters looms over much of the motivation for these initiatives, particularly in food and exercise, these green ribbon initiatives are not overtly considered or referred to much as "health" projects. Indeed, the school nurse gets a nod here and there, but it is obvious that the potential evolution to broader health and wellness coaching is the most underdeveloped concept in evidence in this program. While 78 schools may not appear to be many within a total K-12 school population of 130,000, the coordinators from the states who applied their schools noted that many more are engaged in these activities. A Pennsylvania deputy secretary of education told me that in addition to the four PA schools selected for the green ribbon more than 100 others applied. The Green Ribbon School program created three "pillars" to measure greenness: environmental impact and energy efficiency; healthy school environments; and environmental and sustainability education. These criteria led to a diverse selection of programs, although the school garden has become widely adopted for food production, composting, even sales, and nutrition education. Solar energy, using bio-diesel and waste kitchen oils and fuel, and water collection systems were a few of the projects that created new forms of engagement for these schools and often with the broader community. Most impressive about this singular gathering of the inaugural green ribbon schools was the breadth of innovation that is now at work across the country. These projects are in various states of formation, operations, financing and stability, but all are earnestly taking the initiative to change the prevailing paradigm within their communities. The Dept. of Education didn't inaugurate these endeavors, but it deserves kudos for raising awareness about them and for the broader intention that their work represents. In his remarks US Secretary of Education Arne Duncan said the collective experience of this first class of award winners has proven that the idea of green school "is no longer a specialty area" and that "every school in the country is seeking what has been developed among these schools." Duncan also made a point of noting the collaborations at the state and local levels that created, fostered and supported the school programs, as well as the recent collaboration among federal agencies to support the Green Ribbon program. These initiatives and the federal support were undertaken without any special authorization from Congress, a fact he suggested might be instructive to those members. "This is a program with no natural enemies," he said. The department has already started taking applications for the 2013 (which will not include any of the first year's winners), and will soon begin a series of webinars to help other schools prepare their applications. Program director Andrea Falken said that there was a plan to create a yet-to-be defined clearinghouse where the progress of the first group of awardees can be tracked. While these fabulous initiatives still remain a small collection of brushfires, their experiences have the potential to evolve, perhaps even rapidly, throughout the nation's school community. Along with other locally oriented health programs, such as the Community Transformation Grants that are part of the National Prevention fund, the attention to the health quality and infrastructure of the schools could do much to influence the broader communities in which they are located and create opportunities for local integrative health and wellness practitioners.